A scenic walk near this well known landmark in Scrabo Country Park. Enjoy the views over Newtownards and the beautiful Strangford Lough. The cache is a small Tupperware-style box hidden near to Scrabo Tower. This cache was adopted by wildlifewriter from 16/05/06 until 08/09/11. It is now owned and maintained by wildfowler. Please contact him regarding any maintenance issues. The undulating maritime landscape of North Down has been watched over for more than a century by the Londonderry Monument, commonly known as Scrabo Tower. The tower, which is visible from many miles away, is a marked replica of some of the Scottish watch-towers, which were built along the border that played a part in the forays of long ago. The name Scrabo is said to come from the Gaelic words for a cow pasture. The stone or hut circles, many of them destroyed by the creation of the golf course, recall the days when there was a community pasture for cattle on the hill. On the top stood a great cairn of stones surrounded by an earth and stone rampart, which would appear to have been the place of habitation of some long forgotten chieftain of the Ards. As they shovelled through the stone, the navvies also found what would appear to be his burial chamber - with cinerary urns, charred bones and an Irish-Danish coin dated about the 12th century. Scrabo became part of the monastic estate of the Dominicans and was held by them until the dissolution of the monasteries. In 1675 it was referred to as 'Scrabo Hill's or 'Wilson's Land'. This turreted tower, as it stands today, was built on a site 540 feet above sea level and is 125 feet (41 metres) high. The walls are over a metre thick and the entire building is constructed of stone from Scrabo Hill. The walls are of the dark dolerite rock, which forms the summit of the hill, while the roof, stairs, quoins and window dressings are of Scrabo sandstone. Fame belongs to history, remembrance to us 1857"
Erected in 1857, the Tower was built by local people as a monument to Charles William Stewart, 3rd Marquess of Londonderry. The marquis was a local landowner and nobleman with a distinguished military and diplomatic career. He was Lieutenant Colonel of the light Dragoons and fought in 25 major battles, earning the nickname the 'Fighting Marquis'. He was also Adjutant General to the Duke of Wellington, during the Napoleonic Wars, before becoming diplomat as Envoy Extraordinary in Prussia and Ambassador in Austria. The Third Marquis, inherited the title and family seat of Mount Stewart after his brother, The Second Marquis, committed suicide. The Second Marquis is better know as Viscount Castlereagh who served a term as Britain's Secretary of State for Foreign Affairs. Besides earning fame and fortune overseas, the Marquis was held in high regard in Ireland for his attempts to alleviate suffering during the potato famine in the second quarter of the nineteenth century. His generosity and kindness to his tenants gained him a level of respect, which was not commonly given to the landed gentry and led to a communal desire to erect a monument in his memory. Following his death in 1854, a meeting was organised to discuss how the Marquis should be commemorated. The meeting, held in the Newtownards Rectory, agreed on the desirability of building a monument, but opinions as to its location differed, with one faction favouring Scrabo Hill and another favouring Conway Square, Newtownards. The issue was eventually resolved in favour of Scrabo when a second meeting was held in the Imperial Hotel, Belfast in 1855. On December 27 1855, the question of the design of monument was considered and it was decided to make the issue a competition. The architect's designs were to be received before February 1 1856. No particular kind of monument was required, but an obelisk or tower would have a preference. Two prizes were offered - £20 and £15 - and the cost of the work was not to exceed £2000. Four designs were considered. The one placed first was an obelisk by W J Barre of Newy, the second a tower by J Boyd of Belfast and the other two were towers by Daniel Hanus, assistant county surveyor and Charles Lanyon, afterwards Sir Charles, whose design was placed fourth. When tenders were received the first three cost more than £2000 and Lanyon's design was adopted because it came within the specified outlay. The winning design of W J Barre was priced by Messrs McLaughlin & Harvey, Belfast, at 20 per cent above the proposed cost of £2000. The ironic outcome of the competition and the adoption of the Lanyon scheme was that it ultimately proved too expensive and the design was altered in order to reduce the costs. The tower was therefore shortened, the small towers were reduced in size, the buttress walls were deleted and the interior left incomplete. Yet the Tower still cost much more than planned, the eventual cost being over £3000. 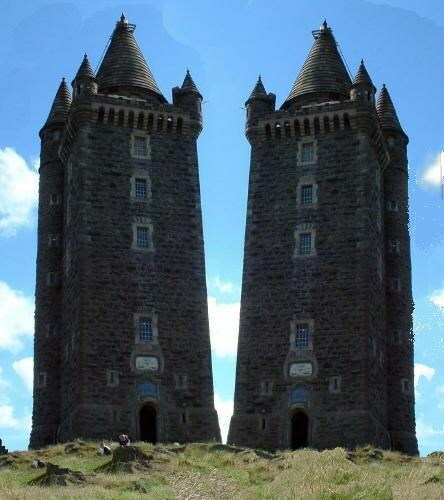 The first tenant of the tower was William McKay, a foreman at the quarry, who, with his wife, brought up a family of eight children in the tower. The care of the tower actually remained in the hands of McKay's family for more than 100 years. In fact, the Millin sisters, Elizabeth, Jean and Agnes, who handed back the keys to the Londonderry Estate in 1966 were William McKay's grandchildren. The Misses Millin, who were all born in the Tower, ran a very popular tearoom there, specialising in Irish country teas, an essential ingredient of which was goat's milk. A small herd of wild goats, descendants of the original animals, still roam the hillside, but they are timid creatures and are rarely seen by visitors. After the tower was vacated, it became clear that its condition was deteriorating. The problems were due partly to the omission of the original buttress walls as a cost cutting exercise during construction and partly due to the internal damage caused by rainwater penetration and lightning strikes. The Department of the Environment undertook a massive programme of remedial works including re-pointing, stonework restoration, door and window replacements, tying of the walls with two additional floors and the provision of lightning conductors. In 1983 the Tower reopened to the public following its restoration. The tower has now been converted into a countryside centre for the Countryside and Wildlife Branch of the Department of the Environment (NI) and houses a permanent exhibition on the Country Park and the surrounding countryside. It is open during the summer months when visitors can climb the 122 steps to a viewing platform at the top of the tower and gain a panoramic view of the landscape. The islands and coastline of Strangford Lough dominate the foreground, while, on clear days, there are distant views of the Isle of Man, Ailsa Craig and the Scottish coast to the east and the peaks of the Mournes to the south. Tebhaq yriry oruvaq n phegnva bs vil. Two Towers of ScraboWelcome to Middle Earth, halfling!